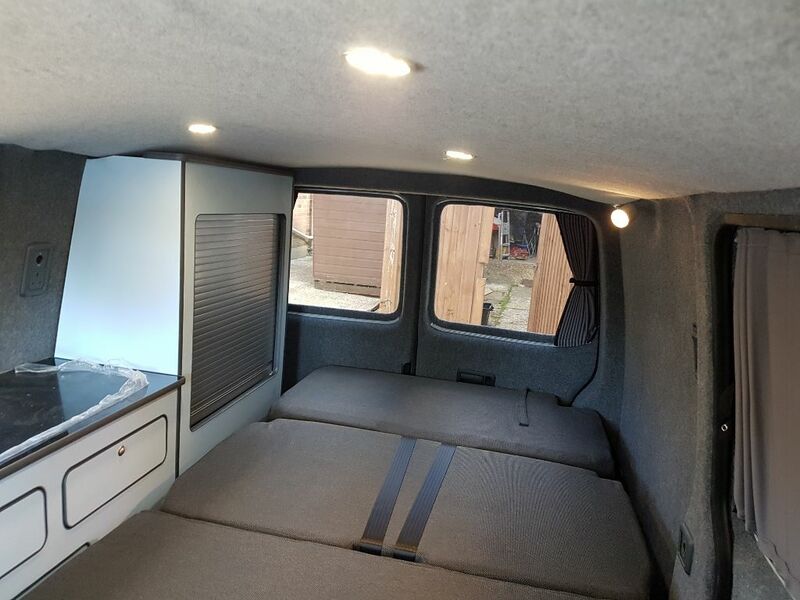 ... to make the interior of you van as quite and comfortable as possible. After we receive the van in an empty and relatively clean state, we carry out a final clean down so that the surfaces of the van are ready for us to work with. This is when we install the "sound membrane". This is a 25db rated thermal sound deadening product. 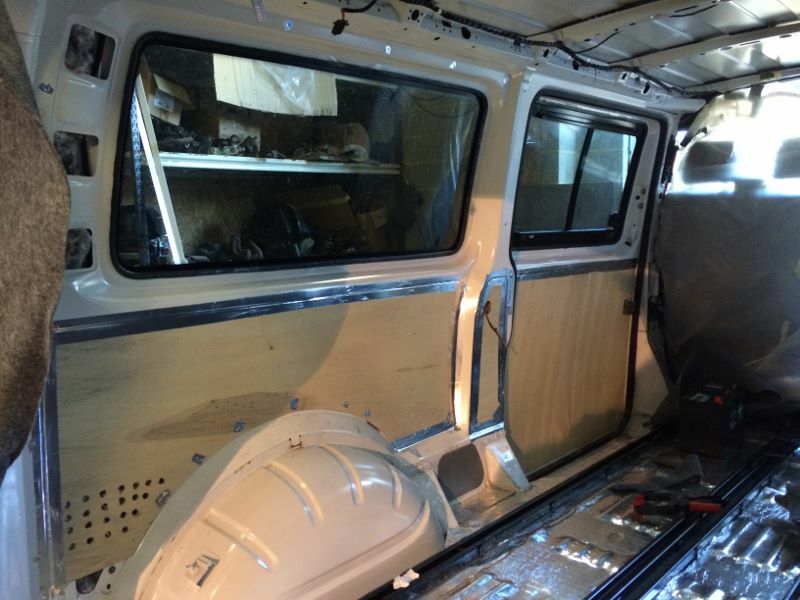 This is applied to all single skin areas of the van (Excluding front doors) and acts as the first stage of protection to reduce or eliminate the drumming of the side panels. The cavities of the wall and door spaces are then filled with a 100% recycled bulk insulation. 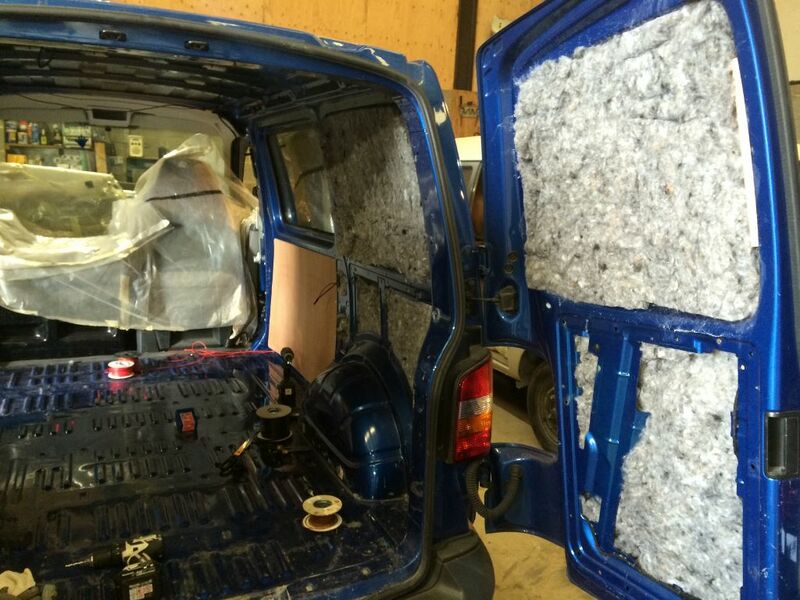 This gives the van its main thermal barrier as well as removing as much of the remaining road noise as possible. We then install our own CNC cut plywood panels to the sides and doors of the van, This not only gives us the perfect base to obtain a smooth lining finish, but it acts as an additional stage of noise reduction as it finishes off the "box" that creates the sound barrier. 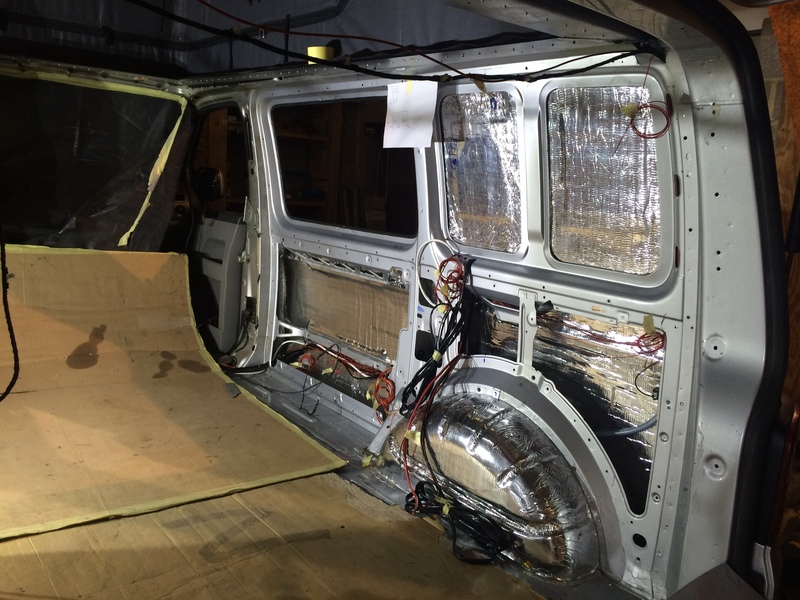 By trapping the insulation between the metal of the van and the plywood, the sound is channeled into the insulation. Once these are fixed into place, we tape all joints and holes in the van, this allows a much neater finish to edges of the panels and smooths out any dips that may otherwise appear in the carpet surface. It also acts as a barrier to prevent dirt and dust finding its way in from the insulated cavity and causing dirty marks on your carpet. Air will still be able to move around in your wall space and if you leave these holes and gaps uncovered, you will eventually be left with black spots throughout your carpet finish. 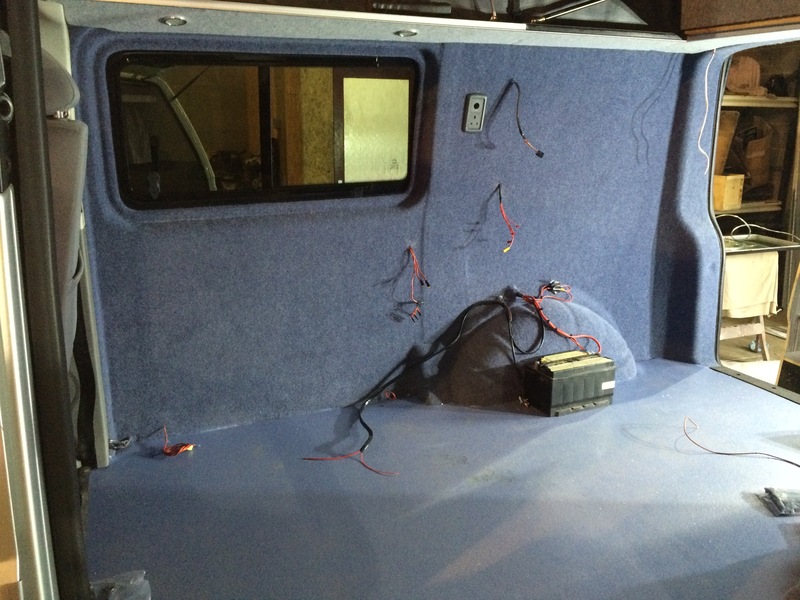 The last stage finalises the sound protection and gives the visual finish to the inside of the van. The carpet follows the lines of the van neatly and gives a coach finish. There are a few options for carpet colour too. We carpet the complete sides all in one piece, this way you don't get unsightly joins or overlaps that removable panels leave you with. Similarly we also carpet the entire door or doors, up to the seal edge and apply our own weather seal to protect the carpet edge and not allow any water ingress. 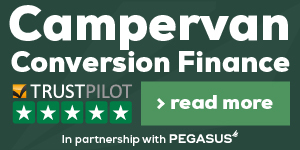 We have seen plenty of vans where people have tried this and have carpeted past the door seal which doesn't allow the seal to do what it needs to do and then causes water to leak in and ruin your carpet lining. Our process avoids all of these issues. We have, so far, found no substantial advantage to having removable panels as it is very unlikely you are ever going to need to gain access to the wall spaces. If you are worried about installing electrical systems at a later date, we can discuss this and either leave provision in the wall space or conduits so you can feed cables through when you are ready. If we are dong this process as part of a full or part conversion, we will run all the cables we require into the wall space as standard. Beware of cheap jobs, if they seem too good to be true, they probably are. Once your van has been insulated and carpet lined, the next stage you will need is floor to be put down. If you are planning to fit a Rock and Roll bed, most bed systems require a floor depth of 15mm. We cut our floors from a single sheet of 10ftx5ft 12mm hardwood plywood on our in house CNC machine. This allows us to fit a floor that wont drop or be miss leveled with any joins, as there aren't any (except the rear N/S corner, but you wont know it). We then apply your choice of floor covering. The most common coverings we fit are from the Altro contrax range and this is what our pricing is based on. We are able to accommodate almost all floor types that are available from a roll should you want something a little different. To finish off your flooring we offer sliding door and rear door threshold covers, these take into account the increase in floor height. The below prices are supply and fit and include wiring in the light in the sliding door step. We don't like seeing joins in anything as it looks untidy and unprofessional. So we developed this One Piece headlining a while back. this takes the place of your original two piece headlining and is designed to meet the cab headlining and can be finished in your choice of colour.